Fall is finally here! For weeks, I’ve been seeing everything pumpkin spice through social media and in stores. It’s so exciting! From pumpkin spice deodorant, candles, cookies, drinks and everything really. Pumpkin spice is my favorite fall flavor and I can’t wait to share with you how I’ve incorporated it into one of my daily snacks. Now that the kids are back in school, the summer time excuses for my diet are gone. I feel like most people are that way too. I’ve been hitting my macro plan hard and have been looking for ways to spice up some of my favorite snacks. Protein is my hardest macro to hit and you can only stand so many protein shakes in the day. You know? So to keep on track with my goals, keep my taste buds happy and to fall into the pumpkin spice season, I’ve upped the bar with my greek yogurt. If you haven’t noticed in the stores, there is now a pumpkin spice greek yogurt flavor. And it’s HEAVEN!!! I’ve been eating it daily, seriously. 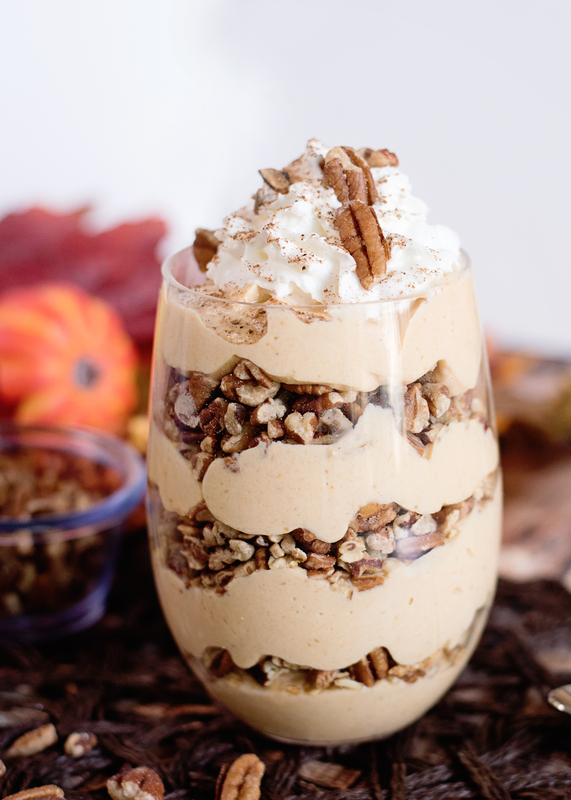 And while greek yogurt has a great shot of protein, I’ve made a few changes to increase the protein, increase the AHHH factor and turned it into an amazingly healthy way to enjoy pumpkin spice everything. For years, I’ve been putting protein powder into my greek yogurt. Have you done this yet? If you mix the perfect amount of protein powder into your greek yogurt, it will increase the protein macro without compromising the taste or texture. 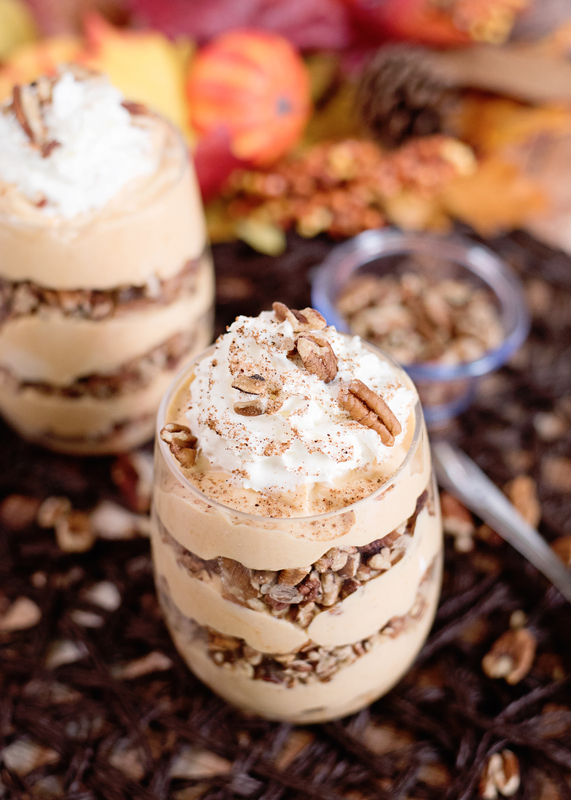 For this pumpkin spice protein parfait, I’ve combined the pumpkin spice greek yogurt cup with about half a scoop of Premier Protein Whey Powder in Vanilla, added some pecans, a little nutmeg and whipped cream to top of my carb macros (optional). Full recipe is below. Premier Protein 100% Whey Powder is packed with protein, not sugar or calories. That’s why I love this as an addition to my favorite greek yogurt. A full scoop is loaded with 30g of protein, making it perfect for shakes, smoothies and cooking. So even with a half scoop, like what I use in this recipe, there is still an additional 15g of protein added to your snack. Have you added protein powder to your greek yogurt before? Try it! The varieties are endless and the macros are perfect! In a medium bowl, mix together the greek yogurt and protein powder until well combined and creamy. Add in the nutmeg. 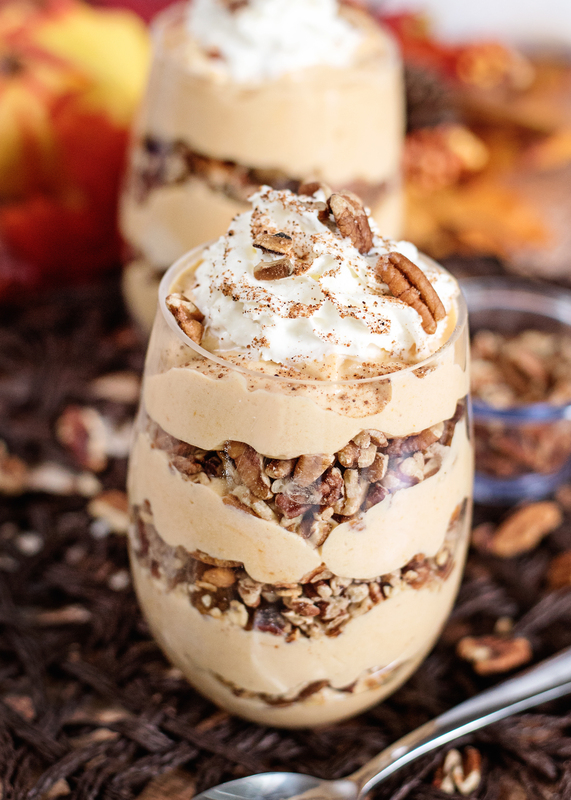 In a parfait dish, layer the pumpkin spice greek yogurt mixture and the pecans. Top with your optional whipped topping. This would also be good mixed up and thrown into a bowl. It all tastes the same, parfaits make it a little more fancier! Disclosure: This post is sponsored by Premier Protein. All thoughts and delicious opinions are my own! See what the other Premier Protein Ambassadors are up to this month!